Although the Dickens Museum ceramics were officially launched at the event, they were actually on sale and announced in High Street News beforehand. The Pickwick Papers had been serialised in monthly parts for a year and was proving a great success; Charles Dickens’ publishers were planning a celebration dinner for him. Charles and Catherine, while celebrating their first anniversary in April 1837, were able to move into No 48 in the very smart gated private road in Holborn. The gates were kept by porters dressed in ‘mulberry coloured livery, with gold-laced hats and buttons decorated with the Doughty arms’. Whilst there, Charles wrote and worked on several major and minor works including Oliver Twist and Nicholas Nickleby. In 1923 the building was threatened with demolition, but was saved by the Dickens Fellowship, a society founded in 1902 for Dickens lovers. They renovated the building and gathered a collection suitable for opening as Dickens House Museum in 1925. It also became headquarters of the Fellowship. 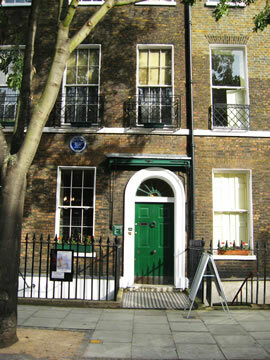 It is a fascinating place to visit for anyone interested domestic life in the past as well as for Dickens appreciators. The library in the basement is especially atmospheric. The street is such a pleasure to walk down. There is little that grates. It has miraculously survived both bombs and careless developers. Further down the street is the blue plaqued house of Vera Brittain, mother to (politican) Shirley Williams and author of ‘Testament of Youth'. This was the official launch at the Dickens Museum, 48 Doughty St, London of the Dickens Museum ceramics for both the 'Nation of Shopkeepers' and 'Heritage' collections. It was well attended with over 50 people from far and wide including the US! Hazle Ceramics laid on a buffet of savoury profiteroles, cakes and drinks. In a special presentation and toast, Hazle handed over to great-grandson Cedric Charles Dickens unique gilded versions of each ceramic for permanent display at the Museum. The Museum Shop will sell standard versions of both these and The Old Curiosity Shop. Cedric, at 86 years a charming and quintessentially English gentleman, came across as a 'larger than life' character who could have originated from a novel by his great-grandfather, to whom he bore a physical resemblance. He obligingly spent most of the afternoon signing ceramics and certificates and appeared to be thoroughly enjoying himself. The conversation was peppered with anecdotes and recipes from his cookbook where alcohol seemed to be the one indispensable ingredient! The event took place in the basement Library as illustrated in the panorama below. Cedric ate his lunch at the large oak table in the centre of the room sitting in the carver chair just visible below right, with Hazle and myself either side of him. The buffet and ceramics were laid out in the former kitchen next door. Hot drinks were brewed in the pantry across the hall. Hazle has just declared the recent Dickens Event a huge personal favourite. In her precious (little!) spare time Hazle is bit of a bookworm buying first editions and going to literary festivals such as Hay-on-Wye. So just picture the scene: Hazle sitting at the oak table, surrounded by Dickens’ books and revelling in the atmosphere of the house, so richly evocative of him and his Victorian era. Next to her sits Cedric, proud ambassador and likeness of his ancestor, signing HER creative works! From Marilyn on 27th November 2006: With no digital camera at the time, photos were added for this site. Along with Signing Specials, the entire current range was on display, plus a few retired pieces to show that this is a company "with a past"! 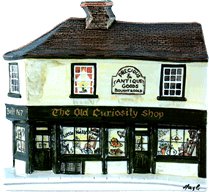 The Open Edition Old Curiosity Shop was painted as a modern antiques shop. But this is Judy Brett's hand painted Dickensian version, with Little Nell in the window. Developed specially for the event, all the artefacts are authentic period items and there are even damp patches on the wall! The building in Portsmouth Street, Holborn is in the same area as Doughty Street and Charles Dickens would definitely have known it. Today it is a clothes shop which pretends to be permanently closed to deter hordes of Dickens fans! This piece featured in DK Collectables Guide's, 'A Closer Look at a Hazle Ceramic' 2007. A character from the novel above, the detailed window by Chris McAllister shows Daniel in a frock coat kneeling in his candlelit counting-house. Painted on Bath Chemist. The standard flatback Open Edition of the Dickens Museum at 48 Doughty Street. From that novel, with a shipping theme. By Iona Driver on Windsor Thames Street. The dressmaker to whom Kate, sister of Nicholas Nickleby, was apprenticed. Until ladies' dress shops became established, it was common to have one's clothes individually made by a dressmaker, who often worked behind a milliner's as here. Do you remember in A Christmas Carol when the Ghost of Christmas Past takes Scrooge back to the annual Christmas Ball at Fezziwigs, where he trained to be an accountant? When I heard Sharon was retiring it was my last chance to get her to do this! Painted on Windsor Curfew Yard - and definitely inspired by the Dickens Event. The novel was published in 1843 so Sharon's depiction of Santa Claus, introduced to England from Germany in 1840, is feasible! There were several event one-offs, including an Apothecary on London Prospect (from Nicholas Nickleby), Fezziwigs Office on Hay-on-Wye and Fagin's Cavern (from Oliver Twist) on Windsor Thames Street. The second London peace march, non-functioning trains, and belligerent taxi drivers tried to prevent us all meeting up, but they were no match for Cedric Charles Dickens, Lillian Jarmie and the intrepid collectors of Hazle Ceramics. Hazle counts it as her best day ever. There was something very special about meeting in that lovely basement Library in a house of such history. Cedric Charles (Charles Dickens’ great grandson, author of ‘The Miracle of Pickwick’ amongst other books) charmed us all. He obligingly signed certificates and ceramics, engaged us in conversation - and told us about his trips with his wife to Philadelphia where the only sculpture of Charles Dickens is located. Having had a difficult journey in to London from Sherborne his return taxi didn’t arrive, so he set off walking to Paddington station - as his great grandfather would have done of course. Good friends Mrs Sample and Mrs O’Leary, from Norwich, got all the way to Liverpool Street Station, but peace march activity prevented them from getting across town. Lillian Jarmie, who instigated the production of the ceramic, flew over from Connecticut for the week to be there. Those of you who met him will be saddened to hear of the death of Cedric Charles Dickens, great-grandson of Charles Dickens and steward of his legacy. 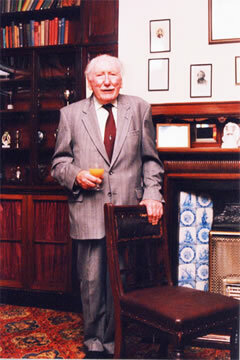 Born September 24 1916, he died on February 11 2006 aged 89. "Cedric Dickens was the embodiment of one of his great-grandfathers most enduring and best-loved characters. He radiated bonhomie and charm and made friends all over the world in his long quest to promote the love of Charles Dickens' mighty oeuvre. Well hidden behind the benevolent and studiedly humbling persona, however, was a brilliant managerial brain. He greeted everyone with the same courtesy yet had the knack of getting people to do things they did not think they were going to do or even could do. He worked indefatigably to save the George and Vulture, the historic inn in the City which Charles Dickens used in his fiction as a frequent venue for Pickwick's peregrinations and in his own life as a favourite watering-hole. Cedric worked ceaselessly to preserve the heritage of Gad's Hill, now a girls' school and he was a firm ally of the house in Doughty Street, now a museum, where his great grandfather first lived as a young married man." This, of course, is the venue where our Club members had the privilege of meeting this charming man. (I thought his charm had a touch of the actor Leslie Phillips about him.) At the age of 86, due to Peace Marchers and traffic problems, he had to cross London from Doughty Street to Paddington Station on foot, as I am sure his great-grandfather would have done. He did it with good cheer and a few days later flew off to Philadelphia where the only full statue of Dickens exists. "So deep is the affection felt for Cedric in America that the Philadelphia Pickwick Club is to hold its own memorial service in April. At the last dinner he attended in December Cedric was his in usual roaring form. He asked for the usual silence for those members who had "gone ahead to the great tavern where we shall all meet again". Later he remarked - in an aside - that he would not be with them at the next annual dinner. But he knew it would go on as ever, spreading and celebrating what he called, in the last of his five books, The Miracle of Pickwick." I once read that Charles Dickens would sometimes hike 20-30 miles to overcome bouts of depression. When I asked Cedric about this at the Dickens Event, he was uncertain whether his great-grandfather went quite that far but did regularly walk the ten-mile round trip to The Leather Bottle Inn from his home at Gad’s Hill Place on the North Kent coastline. Charles also thought that the seven-mile walk from nearby Rochester to Maidstone was one of the most beautiful in England. After a few moments with him, Cedric came across as the sort of person you could have known all your life. He seemed genuinely touched when Stephen put down a plate of buffet food for him saying, “Oh! that looks nice.” He had probably set off from his home in Sherborne at around 9am for a 12 noon start, it was then about 2.30pm and he must have been very hungry. There is a charming vignette in The Times obituary about him falling off his bicycle when he first saw his future wife, who was driving a truck as a WREN in World War 2. She helped him get up. Trust Cedric to find an original chat-up line! The Times goes on to say that it was a radiantly happy marriage lasting 58 years.